See the Beertown Austin website for videos of Chip McElroy of Live Oak Brewing, Adam DeBower of Real Ale Brewing and Kevin Brand of (512) Brewing. This Saturday, August 1st, is the monthly tour and tasting day at Independence Brewing in Austin. Entrance is FREE and includes 3 beer sample tickets. If you buy an Independence pint glass (or bring one with you), you'll get that filled instead of an 8oz sample glass. Don't forget your ID and you may want to bring a lawn chair and shade umbrella or tent (it'll probably be a hot one out there). Entrance to the brewery begins at 1:00pm and beer tickets are only handed out between 1 ~ 2 pm, so get their early. More information, including a map to the brewery, is available on the website. 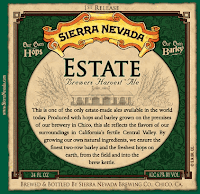 Sierra Nevada Brewing Company has become one of the first American breweries to produce an estate-brewed beer. It all started in 2003 when they planted their first experimental hop yard. After years of growing and tending the hops, Chico Estate Harvest Ale, which was brewed using only their own fresh green hops, was released in 2008. In January of this year they took it one step further and planted 26 acres of two-row barley and the results of that first crop was an unexpected success. They are now in the unique position of being able to produce an estate-brewed beer, a beer brewed with 100% of the hops and barley grown at their brewery. This is certainly a story that interested me as I have also taken the first steps to produce an "estate beer". Earlier this spring, I planted my first hops in pots in the backyard in an effort to eventually brew a beer using home-grown hops. You can follow the progress at my other blog, Hops In Pots. I doubt my wife would allow me to take the next step of plowing up the backyard and planting two row barley. However, Chris Colby of Brew Your Own (BYO) magazine has done exactly that at his home in Bastrop, TX. Chris had been growing hops at home for years and recently took that next step which you can read about on his blog at BYO magazine. Brew Your Own magazine posted the winners of their 2009 label contest. I created my own label for one of my homebrews once... once! The joy that I felt from seeing my own label on a bottle of beer that I brewed was just not worth an afternoon of soaking and scrubbing the labels back off the empty bottles. A great deal of effort and creativity (and odd senses of humour) obviously went into these winning entries and it's almost inspired me to make my own again... almost. 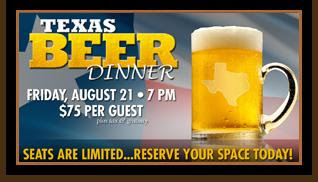 Cullen’s Upscale American Grille in Clear Lake is hosting a Texas Beer Dinner on August 21st. Appetizers are paired with Lonestar served in a can which is followed by five courses, each paired with a different Texas brewed beer. Our Independence Pale Ale is paired with Chicken Fried Quail in course 3. 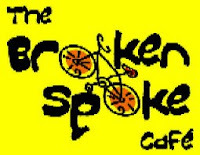 The full menu for the evening is available on their website. $75 per guest (+ tax and tip) and reservations are required. I already picked up a copy of his new book and although I've only just started to read it, I'm enjoying it so far. Randy is also the author of Radical Brewing: Recipes, Tales and World-Altering Meditations in a Glass. Celebrate Independence Day at Independence Brewing in Austin, TX. Saturday, July 4th is also the monthly Tour & Tasting Day at the brewery and what better way to celebrate the holiday then with a cold Independence Pale Ale. Entrance to the brewery begins at 1:00pm and beer tasting tickets will be handed out until 2:00 pm. More information is available on the website.